Ascending Butterfly: Not So Wordless Wednesday: Move over Dancing With the Stars, it's time for your child to shine in the Curious George Dance Contest! Not So Wordless Wednesday: Move over Dancing With the Stars, it's time for your child to shine in the Curious George Dance Contest! If like me, you enjoyed the first episode of this season's Dancing With The Stars this week, and have been running around the house dancing since, I'm sure your child has been watching and imitating you! As many of you remember last year I became a 'Curious George Moms' Brand Ambassador and helped host a twitter party for the Curious George Mother's Day/Dia de Las Madres episode (you can read about that HERE if you missed it the first time) and as Curious George was so special to me as a child, and I enjoyed sharing his antics with my niece and my nephews I jumped at the chance to share his latest adventure with you all. Our friends at Curious George are back to share a new fun campaign they are working on where your child has the chance to be the star! 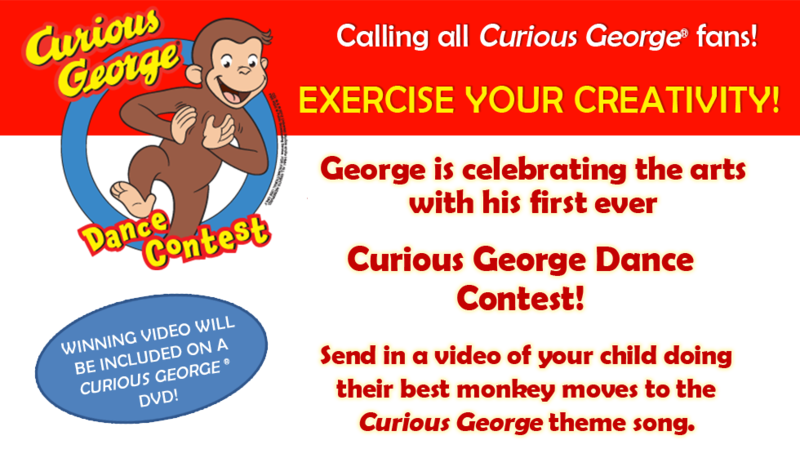 Curious George is hosting his first ever 'Curious George Dance Contest'. 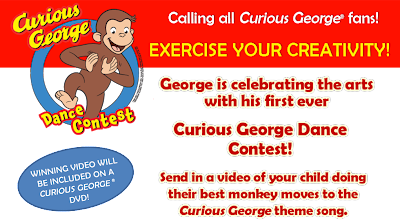 Send in a video of your child doing their best monkey moves along to the Curious George theme song for a chance to win! CONTEST DATES: Video Submissions are due by April 2nd. PUBLIC VOTING PERIOD: April 16th to April 30th. 1. Dancing Promotes Creativity - It encourages Self-Expression, done in early childhood it helps to develop creativity and creative problem solving will serve your child for life. 2. Dancing Strengthens Social and Emotional Development - It helps a child express themselves and communicate with the world around them. 3. Active Learning - Children glean a greater understanding of spatial development via dance. 4. Dancing Promotes Fitness - The same Cardiovascular Endurance, Muscular Strength, and flexibility you gain from dance your child does too! Does your child love Curious George? Does your child love to dance? 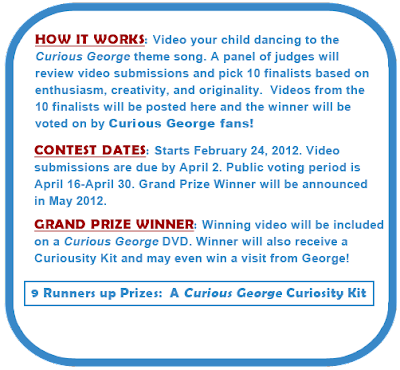 Then grab your video camera and film your child dancing to the Curious George theme song for a chance to win. And if your child is already expressing hollywood aspirations, having their dance video featured on a Curious George DVD will help put them on their way that's for sure! FTC Disclosure: I am a 'Curious George Moms' Brand Ambassador. My participation in this program comes with additional incentives. This post was sponsored in collaboration with Latina Bloggers Connect and WGBH. Images Disclosure: CG (R)& (C) 2012 Universal Studios and/or HMH. All Rights Reserved. FOR PROMOTIONAL USE ONLY. I love Curious Georgia! He was always the one that could get in trouble and we could watch without ourselves getting in trouble! I loved Curious George too! @MySkinConcierge Ava - He was one of my favorites too, and now my nephews love Curious George too!